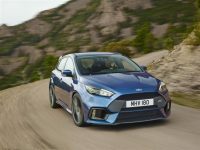 Want to see and hear the new Ford Focus RS charging the backroads of Europe? After initially releasing only a b-roll video without sound, Ford has rethought it’s decision and re-released the video with sound. Here it is in all of it’s turbo-huffing glory! The video highlights the capabilities that Ford’s new performance AWD provides. What you’ll see here couldn’t be done with a FWD performance car, now with a simple Haldex-type AWD system. The difference is the GKN torque vectoring system. Next problem: how to get a deposit made at a local dealer for a Focus RS in this same blue!